If you want a sheet that lists the transactions of any single account linked to your Tiller spreadsheet, and don't want to build it yourself, copy this sheet into your Tiller spreadsheet. Right click the tab called “Account Transactions” at the bottom. Click “Select” to copy the "Account Transactions" sheet into your Tiller spreadsheet as a new sheet. Navigate back to your Tiller spreadsheet and find the new tab along the bottom called “Copy of Account Transactions” and rename the sheet by double clicking the sheet name. To use the sheet, select the account for which you want to view transactions in the drop down in cell B1. 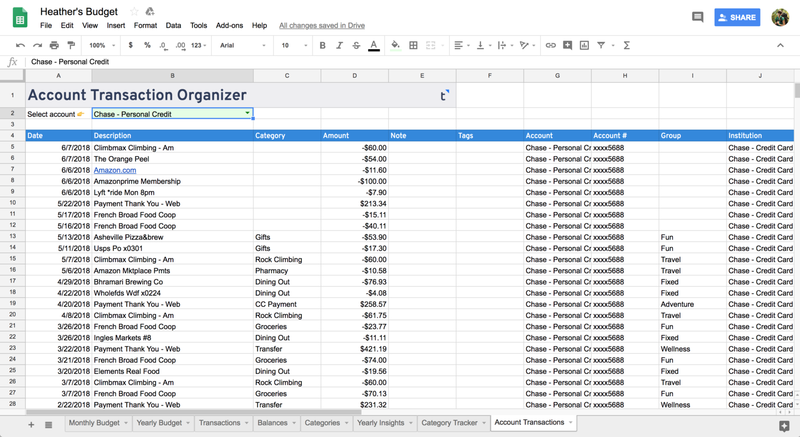 The sheet is pre-built to show the first 10 columns from your Transactions sheet. If you want to view different columns, write down a list of the column letters for the columns you want to see from your Transactions sheet for an account. Then, in the formula in Cell A3 on the Account Transactions sheet replace SELECT A,B,C,D,E,F,G,H,I,J with the letters of the columns you wrote down. Don't make any other change to the formula. Note: This sheet filters transactions using the Account column in your Transactions sheet. If you have a column named Account Name or Account # or Institution that you want to filter by instead, change the name in the hidden column Z in the Account Transactions sheet, in Cell Z1, from "Account" to the column name you want to match.